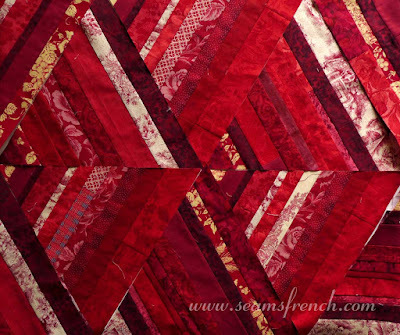 My 4th and last scrap quilt of the year uses up most of the reds and neutrals in the scrap stash, much of which had already been precut into strips. 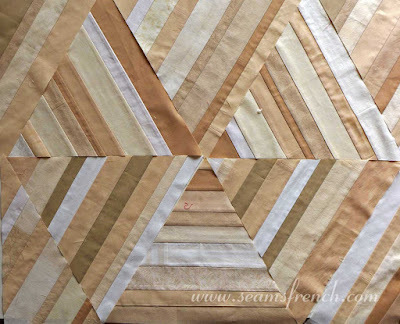 Early in the year, soon after I started this adventure of improv quilting with scraps and stash reduction, I realized how seriously out of my comfort zone the exercise was taking me. To the rescue came several books. 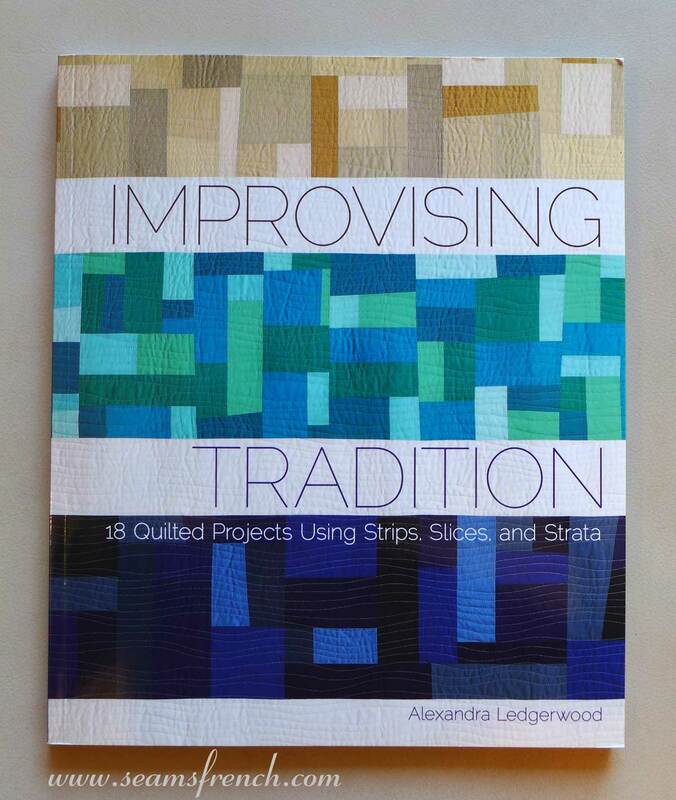 Among them is Alexandra Ledgerwood's book, "Improvising Tradition" which focuses on using precut strips. 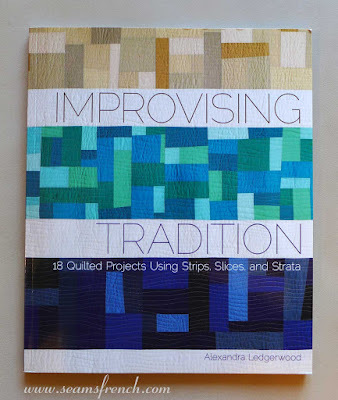 By clarifying her process of "pairing improvised elements and techniques with traditional designs and methods", she has calmed some of the fear and chaos that improv quilting brings to my mind. 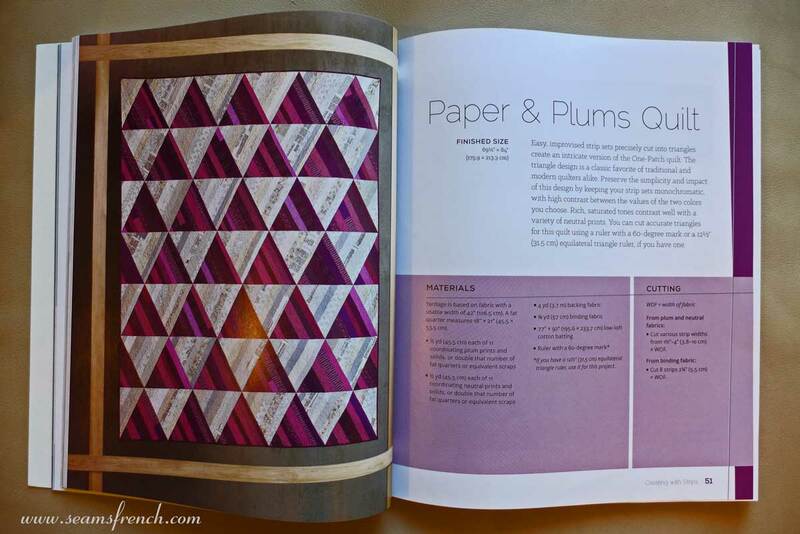 Because so much of my scrap stash is precut strips, I found the book particularly appealing. 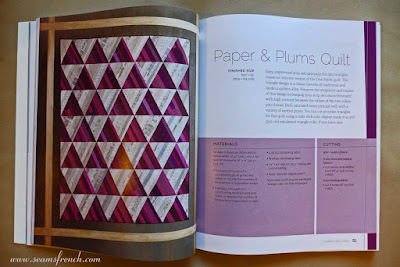 Her pattern "Paper and Plums" with the 12 1/2 inch equilateral triangles was perfect for all of the red and neutral strips in the stash. 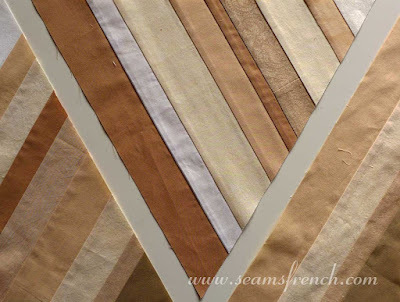 The strips are sewn into 12 1/2 inch widths and then cut at precise 60 degree angles. That's a lot of stripping. I did have to dip into the larger stash to top up the strips, but for the most part, these strips were all left overs from previous projects. Looking at the red blocks now, I'm not crazy about the toile de jouys in the mix, (I find the light background quite jarring), but because the main purpose of this exercise is to use up all scraps, they went into the blocks. The quilt requires 32 full triangles in red as well as 6 half triangles. I'm about half way there. The neutral triangles are completed; 31 full and 8 half. My cumulative block count for the year is 345 to date, which leaves 21 blocks to complete before year's end. Here's hoping that I find the time! In the meantime, we're battening down the hatches and hunkering down for a second weather system moving in overnight and bringing in colder temps and more snow. Earlier in the week, this was taken from our balcony. This amount of snowfall is unusual for this town and Vancouver really slows down with any amount of snow, so I might just get an extra day at the machine this week. Yes, the toiles stood out for me too, but I don't think that's a bad thing. It helps if they are in the middle of the set, so the edges stay defined. It's going to be lovely! 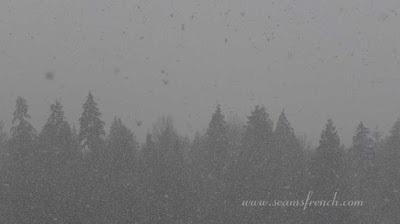 Well the snow did materialize and is still falling in big heavy flakes so I did get my extra day at the machine, however, it was spent finishing Christmas gifts and not scrap quilts. I hope you have a lovely weekend without a whole lot of weather "interruptions". 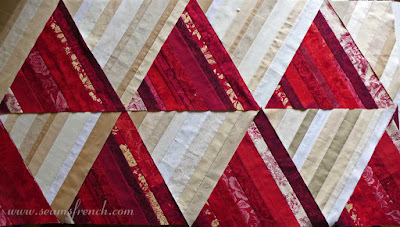 I love your scrappy quilt! It will be lovely and you are nearly done with it! Didn't know that Vancouver rec'd any snow at all...thought it was milder than that. 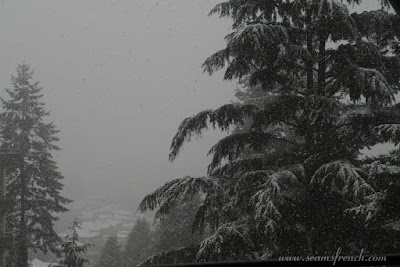 It is beautiful even if it stops movement in the city! Most winters we will see a snowfall or two but the snow generally melts before it hits the ground and doesn't hang around. However, this storm front moved in from the Pacific as a cold front moved down from the north, so this may hang around for more than a few days. I don't mind being confined to my sewing machine, but I was scheduled for a round of hugs from Little H today. Ah well, they will just feel so much better when I get them. I agree with Monica on the toile, as long as it has more solid reds on each side, it looks fine. I also have a lot of strips, this is a great idea to use them. 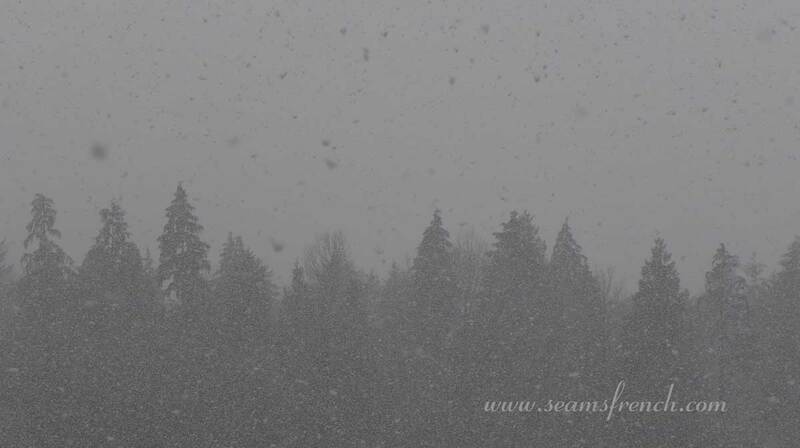 We had snow Wednesday, and will get a bit more tonight. My son is in Seattle and actually got snow! I'm sure he didn't like that after living in Connecticut for 7 years. Yeah, I think that Seattle and Vancouver share many of the same weather patterns. I'm sure he wasn't expecting this kind of snow in Seattle, I know that most Vancouverites don't quite know what to make of it. My 2 year old granddaughter, however, is quite delighted by it.